People who have coronary artery disease (CAD) at an early age may have an inborn problem with cholesterol, especially if premature heart disease seems to run in the family. The most common kind of genetic condition affecting cholesterol is familial hypercholesterolemia. Familial hypercholesterolemia is a genetic syndrome in which LDL cholesterollevels are elevated from the time of birth. People with familial hypercholesterolemia have a high risk of premature CAD, stroke, and peripheral artery disease (PAD). In fact, many people who have a myocardial infarction at a very early age turn out to have this condition. Fortunately, with aggressive treatment to lower cholesterol levels, the risk of heart disease can be greatly reduced. For this reason, it is important to diagnose familial hypercholesterolemia as early as possible — and to make sure that family members of anyone with this condition also have their blood lipids tested. Many people with familial hypercholesterolemia have no symptoms at all until they develop overt CAD (which often causes angina or the more severe symptoms of a heart attack), stroke, or PAD (which often causes severe leg cramps with exertion). Familial hypercholesterolemia can cause characteristic fatty deposits to develop around the elbows, knees, along tendons, and around the cornea of the eyes. These fatty deposits are called xanthomas. Cholesterol deposits on the eyelids, called xanthelasmas, are also common. Whenever a patient has xanthomas or xanthelasmas, the diagnosis of familial hypercholesterolemia should immediately come into the doctor's mind. Familial hypercholesterolemia can be caused by several different genetic defects, most of them affecting the receptor for LDL cholesterol. When the LDL receptor is not working normally, LDL cholesterol is not cleared efficiently from the bloodstream. Consequently, LDL cholesterol builds up in the blood. These excessive LDL cholesterol levels greatly accelerate atherosclerosis and cardiovascular disease. The genetic abnormalities that cause familial hypercholesterolemia can be inherited from the father, the mother, or both parents. People who have inherited the abnormality from both parents are said to be homozygous for familial hypercholesterolemia. People with homozygous familial hypercholesterolemia often develop severe cardiovascular disease at a very young age. It affects one in 250,000 people. People who inherit the abnormal gene from only one parent are said to be heterozygous for familial hypercholesterolemia. This is a less severe form of the disease, but it still greatly increases a person’s cardiovascular risk. Approximately one in 500 people have heterozygous familial hypercholesterolemia. More than 1000 different mutations affecting the LDL receptor gene have been identified, and each of them affects the LDL receptor somewhat differently. For this reason, not all familial hypercholesterolemia is the same. The severity can vary greatly, depending on the particular type of genetic mutation a person has. Prior to the availability of statin drugs, the incidence of premature cardiovascular disease was very high in people with familial hypercholesterolemia and in their relatives. In a large study conducted during the 1970s (prior to statins), 52 percent of male relatives of patients with familial hypercholesterolemia had heart disease by age 60 (compared to an expected risk of 13 percent), and 32 percent of female relatives had heart disease by age 60 (compared to an expected risk of 9 percent. This study drove home the familial nature of this condition. Doctors make the diagnosis of familial hypercholesterolemia by measuring blood lipid levels, and taking into account the family history and physical exam. 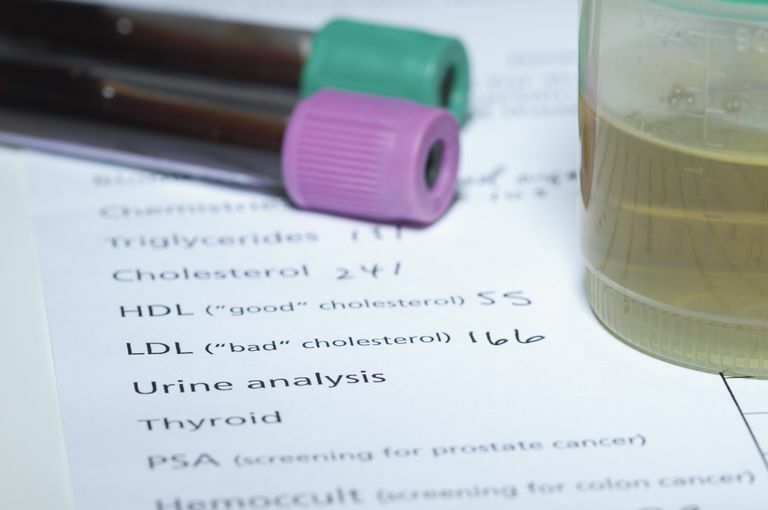 Blood tests in people with familial hypercholesterolemia show high total cholesterol levels and high LDL cholesterol levels. The total cholesterol level with this condition is usually greater than 300 mg/dl in adults, and greater than 250 mg/dl in children. The LDL cholesterol level is usually greater than 200 mg/dl in adults, and greater than 170 mg/dl in children. Triglyceride levels are usually not particularly elevated in people with this condition. Anyone with familial hypercholesterolemia is very likely to have relatives who also have the condition. So a family history of early cardiovascular disease can be a strong clue for the doctor to consider this diagnosis. The presence of xanthomas or xanthelasmas should also alert the doctor to the likelihood of this diagnosis. A presumptive diagnosis of familial hypercholesterolemia can be made if the LDL cholesterol levels are very high, the triglyceride levels are normal, and the family history is compatible. If either xanthomas or xanthelasmas are also present, the diagnosis can be considered fairly definitive. Genetic testing can be helpful (but is usually not necessary) in making the diagnosis, and can be very useful for purposes of genetic counseling. The vascular disease caused by familial hypercholesterolemia begins during childhood. So children in families with this disorder should be routinely screened for high LDL cholesterol levels as young as age eight. If their cholesterol levels are elevated, therapy with statins should be strongly considered. The development of the potent, "second-generation" statin drugs has changed the management of familial hypercholesterolemia. Before the availability of these powerful drugs, the treatment of this disorder required the use of multiple medications, including the less potent "first-generation" statin drugs. While this multi-drug approach did reduce patients’ cardiovascular risk, the therapy could be difficult to tolerate and was certainly difficult to manage. With the development of the more powerful second-generation statins —atorvastatin (Lipitor), rosuvastatin (Crestor), or simvastatin (Zocor)—the approach to treating familial hypercholesterolemia has changed. Treatment is now begun with a high dose of a single, second-generation statin drug. These drugs generally produce a large reduction in LDL cholesterol levels, and may also produce an actual shrinkage of atherosclerotic plaques. If cholesterol levels are not reduced sufficiently with high-dose statins, a second drug should be added. Some experts recommend using Ezitimibe/Vytorin as a second line drug, while others recommend going to the powerful PCSK9 inhibitors. Because reducing LDL cholesterol is so important in people with familial hypercholesterolemia, if statins alone prove to be insufficient they should be referred to a lipid specialist. In people born with the homozygous (severe) form of familial hypercholesterolemia, the cardiovascular risk is so high that very aggressive therapy, managed by a lipid specialist, is recommended immediately when the condition is diagnosed. Because of the extreme elevations in cholesterol seen in these patients, current recommendations are to begin therapy with both high-dose statins and a PCSK9 inhibitor. Even with this type of aggressive drug therapy, however, sometimes cholesterol levels remain high. In these cases, treatment with apheresis may be required to bring cholesterol levels down. While the elevated cholesterol levels greatly increase the risk of heart disease in people with familial hypercholesterolemia, other cardiovascular risk factors remain important as well. So a critical aspect of their treatment is to aggressively control all their other risk factors for heart disease, especially smoking, obesity, lack of exercise, and elevated blood pressure. Familial hypercholesterolemia is a serious inherited disorder of cholesterol metabolism. People with familial hypercholesterolemia need aggressive treatment to reduce cholesterol levels and to control other cardiac risk factors, in order to reduce the risk of premature heart disease. It is also very important for their family members to be tested for this condition. Stone NJ, Levy RI, Fredrickson DS, Verter J. Coronary artery disease in 116 kindred with familial type II hyperlipoproteinemia. Circulation 1974; 49:476. Wiegman A, Rodenburg J, de Jongh S, et al. Family history and cardiovascular risk in familial hypercholesterolemia: data in more than 1000 children. Circulation 2003; 107:1473. Kavey RE, Allada V, Daniels SR, et al. Cardiovascular risk reduction in high-risk pediatric patients: a scientific statement from the American Heart Association Expert Panel on Population and Prevention Science; the Councils on Cardiovascular Disease in the Young, Epidemiology and Prevention, Nutrition, Physical Activity and Metabolism, High Blood Pressure Research, Cardiovascular Nursing, and the Kidney in Heart Disease; and the Interdisciplinary Working Group on Quality of Care and Outcomes Research: endorsed by the American Academy of Pediatrics. Circulation 2006; 114:2710. Sabatine MS, Guigliano RP, Wiviott SD, et al. Efficacy and safety of evolocumab in reducing lipids and cardiovascular events. N Engl J Med 2015; DOI:10.1056/NEJMoa1500858. Are PCSK9 Inhibitors the New Statins? Why Am I Being Referred to a Lipologist? How Important Are Triglyceride Levels for Cardiac Health?